37 · The Little House at Croix-Rousse [Joseph Leborgne] · Georges Simenon; translated by Anthony Boucher · ss; translated from the French (Le Pavillon de la Croix-Rousse, as by Georges Sim, Détective, May 2, 1929 & May 16, 1929). 56 · Murder, 1970 · Pierce Atwater, II · ss; framing story for the following four vignettes. 103 · All Saints Day · Maurice Level · ss Hearsts Magazine Sep 1919; translated from the French (Nès Yeux, Le Journal, 1904). 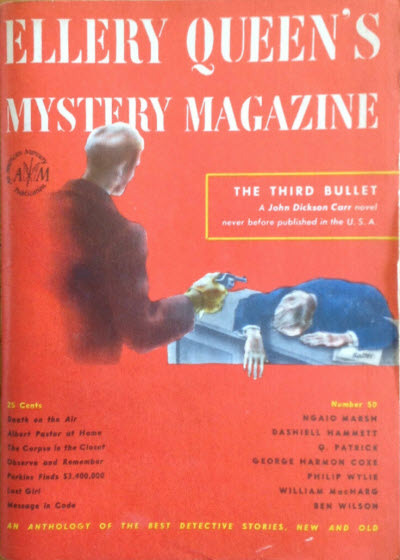 4 · The Third Bullet [Dr. Gideon Fell] · John Dickson Carr · na Hodder & Stoughton 1937, as by Carter Dickson; abridged. 106 · Death on the Air [Insp. (Supt.) 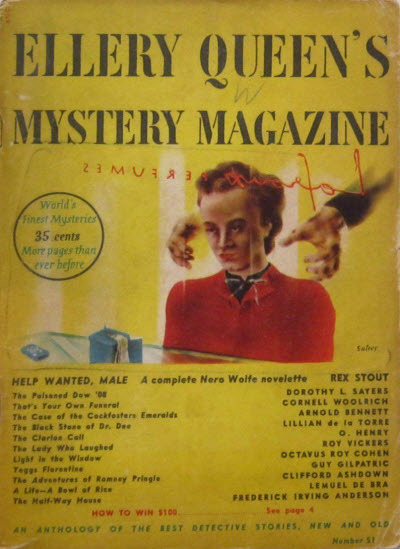 Roderick Alleyn] · Ngaio Marsh & A. Drummond Sharpe · nv The Grand Magazine Feb 1937; given as by Ngaio Marsh alone. 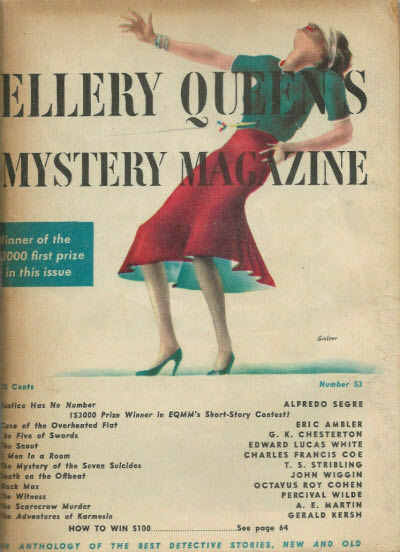 3 · An Open Letters to Readers of Ellery Queens Mystery Magazine · Lawrence E. Spivak · ms; letter about raising the price of EQMM from 25 cents to 35 cents and increasing the page count to 144. 4 · How to Win $100.00 and Have Fun Doing It · Anon. 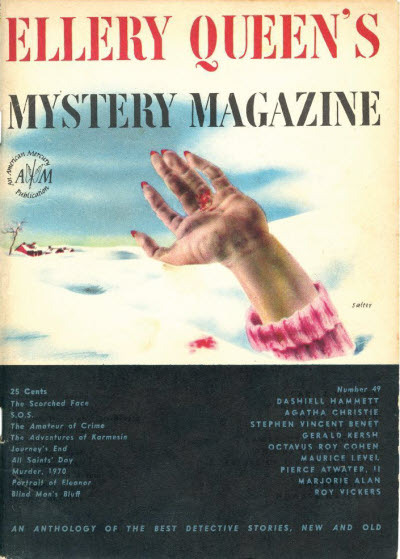 · cn; given as New Cover Contest in the Table of Contents; announcement of contest for best story about Salters cover for this issue. 144 · How to Win $100.00 and Have Fun Doing It · Anon. 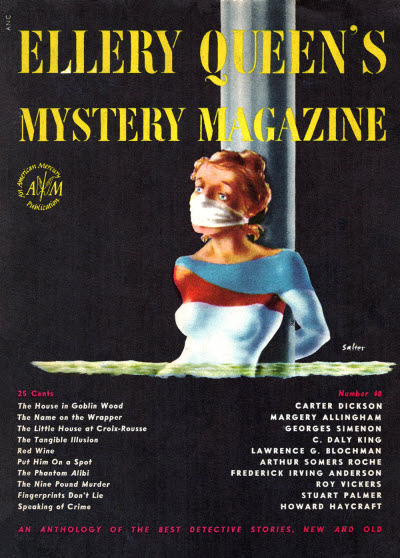 · cn; given as New Cover Contest in the Table of Contents; announcement of contest for best story about Salters cover for this issue. 64 · How to Win $100.00 and Have Fun Doing It · Anon. · cn; given as Third Cover Contest in the Table of Contents; announcement of contest for best story about Salters cover for this issue. 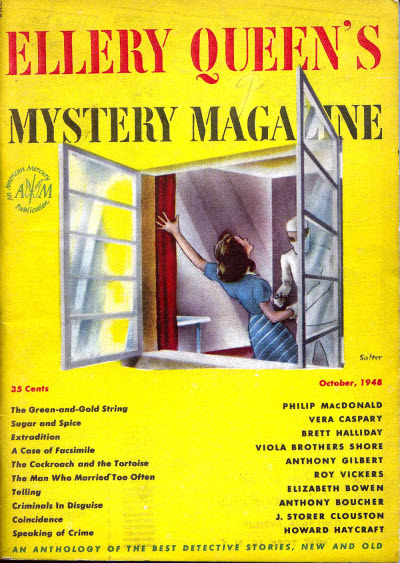 38 · Death in the Window · Warren Amerman · vi; winner of the February 1948 cover contest. 62 · Award of Honor · Frederick Hazlitt Brennan · vi Colliers Jan 5 1935; previously in EQMM Overseas Edition November 1945. 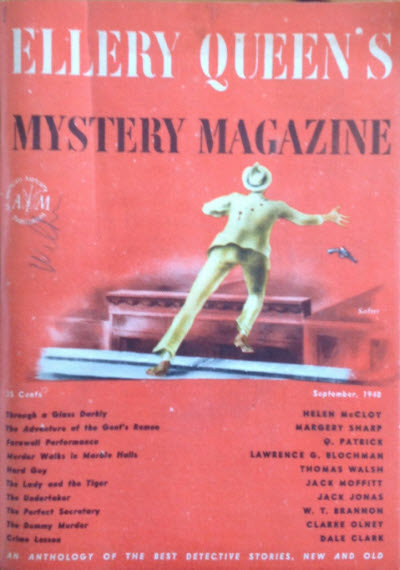 106 · The Man Who Disappeared · L. T. Meade & Robert Eustace · nv The Strand Magazine Dec 1901; condensed. 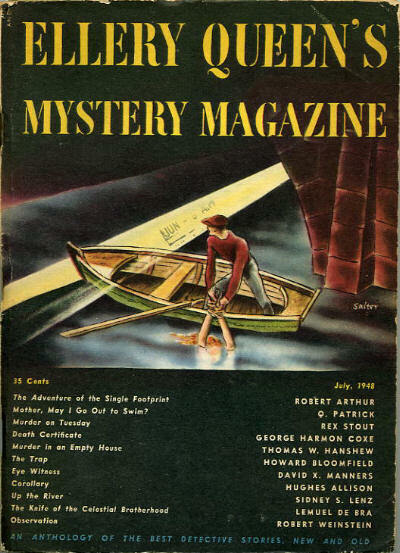 81 · The Phantom Archer · John Dickson Carr · pl; first broadcast on Suspense, CBS radio, Mar 9, 1943. 93 · The Tailors Squares · Secor D. Browne · vi; winner of the March 1948 cover contest. 96 · A Puzzle in Essence · Daniel D. Schoen · vi; second-prize winner of the February 1948 cover contest. 35 · Murder in an Empty House [Hamilton Cleek] · Thomas W. Hanshew · ss Cleeks Greatest Riddles, Simpkin Marshall 1916; slightly condensed from chapters 9, 10 and 11. 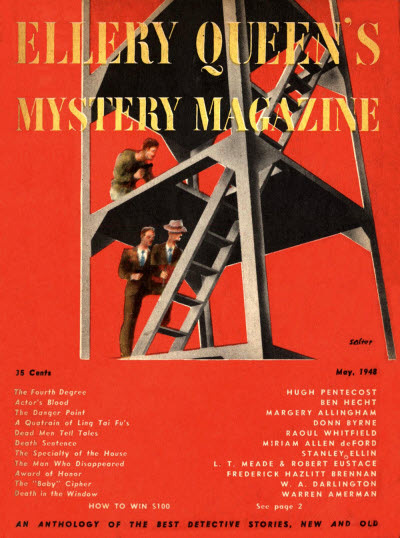 81 · Observation · Robert Weinstein · vi; winner of the April 1948 cover contest. 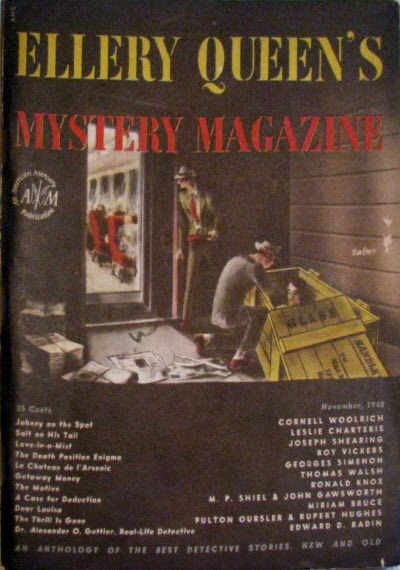 12 · The Chateau of Missing Men [G.7] · Georges Simenon; translated by Anthony Boucher · ss; translated from the French (Les 13 Enigmes, 1932). 101 · The Garden of Forking Paths · Jorge Luís Borges; translated by Anthony Boucher · ss; translated from the Spanish (Ficciones, 1944). 39 · The Lady and the Tiger · Jack Moffitt · nv [Frank R. Stockton]; continuation of Frank R. Stocktons The Lady, Or the Tiger?. 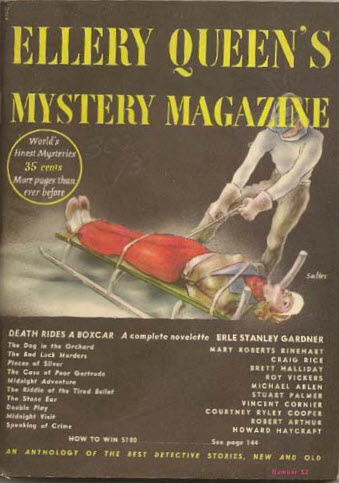 126 · The Dummy Murder · Clarke Olney · vi; winner of the May 1948 cover contest. 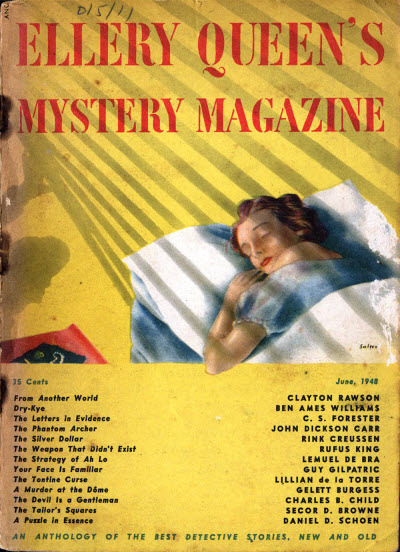 19 · Le Chateau de lArsenic [Dr. Jean Dollent] · Georges Simenon · ss The Strand Magazine Oct 1947; translated from the French (Le Petit Docteur, 1943). 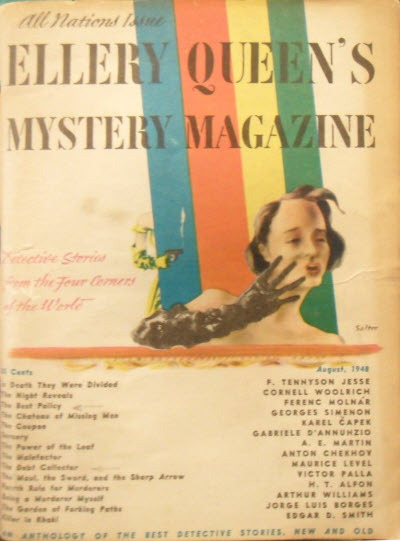 81 · The Thrill Is Gone · Fulton Oursler & Rupert Hughes · vi Colliers 1942; previously in EQMM Overseas Edition September 1945.